Hi from Los Angeles! It has been raining a lot here this winter, which is cool, because we need the water. That drought and everything. We got lucky Thursday morning. It was cool but dry — well, actually cold for us, about 56 degrees Fahrenheit, puffy down jacket weather unless you were dancing — as the local bid committee held a mellow, only-in-California sunrise party at the Los Angeles Memorial Coliseum to mark the coming of the third and final phase of the International Olympic Committee’s campaign for the 2024 Olympics. They lit the Coliseum cauldron, just like Rafer Johnson did in 1984. This being 2017 and a 2024 thing, there was electronic dance music along with before-dawn fitness, a little sunrise volleyball and, 'cuz this is SoCal, some ginger shots to promote your most excellent vibe and good health. Yo, dude. All good. So along with the mellow, everyone, this third and final phase marks an occasion, and here we have to shift gears, for some serious straight talk. Sure, the scene Thursday at the Coliseum was crunchy groovy and for sure Santa Monica can be, like, zany, and Venice, like, wacky, but, you know, we can be dead serious here, too. And the time is now to be straight-up. First, the disclaimer: I have lived in Los Angeles since the end of 1992. If you want to think this column amounts to nothing but a homer talking, go right ahead — there’s likely nothing I can say or do to change your mind and, honestly, I’m not even going to try because that kind of thing gets tiresome. To be abundantly clear: I have no connection, zero, with the LA24 bid committee. We have a normal professional relationship. That’s it. Here is the truth: I have covered every Olympic bid campaign since 1999. It is crystal clear what is at stake. That is why I was the first journalist, in March 2015, to say that the U.S. Olympic Committee had made an inexplicably bad initial choice for 2024 in Boston and needed, as soon as possible, to get back to LA. Which, later in the year, it did. The Olympic movement, meaning in particular the International Olympic Committee, is at a critical inflection point. Over the past 20 years, Games costs have become not just gigantic but obscene. In turn, the number of countries — in particular western democracies — willing to spend millions on the chance to win an Olympics has all but evaporated. Bottom line: the IOC is facing a grave credibility problem. This credibility problem makes for a serious threat to the vitality if not the relevance of the movement. This 2024 race thus offers the IOC a chance to re-calibrate. The only — again, the only — way the IOC can emerge a winner, however, is if it goes to LA. At prior moments in its history, in 1984 and 1932, the IOC has faced similar turning points. At these junctures, it also went to Los Angeles. Now, again, for 2024 it must come once more to California. One more thing, please: this column will take a few minutes to read. No way around it. That's the way straight talk sometimes has to be. Even way out here in California, watching the sun set drop each day into the blue Pacific, we get that you maybe don’t understand us Americans. We get that here in the United States we are surrounded by oceans and just two other countries and our time zones are far away from pretty much everyone else’s and soccer is really not even much of a thing. We even call it soccer, not football. Football is something entirely different here, and we have a super big game, more or less an unofficial national holiday, coming up Sunday. We get that the way we measure distance and temperature and all that — it’s different (if you’re wondering: 56 degrees F is 13 degrees C, more or less). We get that you love our movies and our music and especially our money, like when NBC pays $7.65 billion for the U.S. rights to televise the Olympic Games from 2020 through 2032. Remember, I said this was going to be really straight-up. In that spirit, we get that sometimes you don’t really like us very much. We’re Americans and for some reason we like ice in our drinks, like a lot of ice, and for many if not most of you that’s just weird. In the spirit of gentle and constructive suggestion: you, wherever you are, just have to like us enough right now to give Los Angeles the 2024 Summer Games. For that matter, the very thing that a lot of you have (in some cases defiantly) held against us for many years — that our governments, local, state and federal, are not underwriting the LA bid — is, in fact, this bid’s strongest asset. That’s because we are American and we do it differently here. We even get that our new president is like no one you have maybe ever seen before on the world stage. A lot of us didn’t vote for him, especially in California. Mrs. Clinton won the state by 61-33 percent. We, too, get that Donald Trump is different. You don’t have to like him, either, though to be honest, you might, because he and Vladimir Putin over in Russia seem to get along just fine, and most of you members seem to get along just fine with Mr. Putin’s Olympic vision. At any rate, Mr. Trump is the president of the United States. And behind the scenes, President Trump has already made it very well known that he wants Los Angeles to win. This 2024 race, at its core, is — and always has been, from Day One — a referendum on the United States. Not per se on President Trump. Again, you have to like us just enough to get to yes. Because, as ever, we will save your bacon. You may not like hearing or reading that. But, again, it's straight-up time. After-Games cost estimates ran to $11 to $15 billion. Security costs for the first post-9/11 Summer Games ran up the numbers significantly. The years since have been punctuated by pictures of the Olympic venues in sorrowful disrepair. $40 billion, all-in. Nobody really knows. Accounting transparency is not a thing in China, at least for international consumption. Roughly $15 billion, including infrastructure costs. $51 billion?! This is what you get when, like the children of Israel in the Exodus story who built the cities of Pithom and Ramses for the Egyptian Pharaoh, you build two cities literally from the ground up. For the 2014 Winter Games, the Russians built Adler (the ice venues, a few miles away from Sochi itself) and, up in the mountains, Krasnaya Polyana (ski, snowboard, biathlon), from scratch. Add in some roads, rail lines, electricity, sewage, water and whatever else figures in to the cost of doing business in Russia and there you have it, the reported $51 billion. A brief Rio review: did the thousands of us in attendance endure Zika or water poisoning or get mugged in the streets? Largely, no. Then again, that’s a pretty low bar. The IOC expects in the coming weeks to release figures showing that the Rio operational budget would come in close to the originally estimated figure, $2.9 billion. That number, even if accurate, is both misleading and irrelevant. When Brazil bid for the Games in 2009, it presented an all-in budget to the IOC of $14.4 billion — operations and infrastructure. When the Games were awarded to Rio, the Brazilian economy was going great guns. By 2016, the economy had tanked. The government said it would backstop the project. Problem: the government ran out of money. The final Rio number remains fuzzy. A reasonable estimate: maybe $20 billion. Scary budget! Scary like one of those bad black-and-white Godzilla movies from back in the day! Tokyo won the Games in 2013 promising an all-in budget of roughly $7.8 billion. Last September, a local review panel said drastic changes had to be made or the whole thing might cost, ah, $30 billion. That would be roughly four times as much as $7.8 billion. In December, the IOC said it could not, would not accept a revised budget of $20 billion. See $40 billion, above, and an appreciation of the accounting skills of our Chinese friends, who must, after winning the Games in 2015, build a high-speed rail line from the capital, where the air pollution could choke a duck, up to the mountains two hours away, where there is barely snow but they are nonetheless going to hold the alpine events there because, well, because. At any rate, the Chinese — having learned from their Russian friends — are not going to count the costs of the railway in their Olympic accounting. Which both in the official records as well as media such as this will, you know, keep reporting of the costs down. This brings us, naturally enough, to 2024. The Agenda 2020 vote came amid the 2022 Winter Games bid campaign. That 2022 campaign made it abundantly clear how flawed, if not irretrievably broken, the bid process stands. Six would-be bid cities in Europe dropped out of the 2022 campaign, five put off to varying degrees by the $51 billion figure associated with the 2014 Sochi Winter Games: Oslo, Munich, Stockholm, Davos/St. Moritz and Krakow, Poland. A sixth, Lviv, Ukraine, fell out because of war. That left Beijing and Almaty, Kazakhstan. The members went for Beijing. “Would anyone be surprised, really, if as soon as six months from now, this 2024 race is already down to three? November 2015: Hamburg drops out. Residents vote against hosting the Games. September/October 2016: Rome, after weeks of dithering, drops out, too, the mayor saying the city has other priorities. February 2017: in Budapest the locals are gathering increasing numbers of signatures for a referendum as well, so many signatures that the bid is delaying what would have been Friday’s start of its international promotional strategy. It’s unclear when — if — any promotional activity will begin. That leaves, then, practically speaking, two: Paris and LA. LA and Paris are both fine cities. But any reasonable observer can see that the Olympic bid process needs a fix. All of us will always have Paris. But Paris is not what the Olympic space needs right now. What it needs — what Bach needs, what the IOC needs — is for Agenda 2020 to be more than just so much more than lip-service if not outright BS. As much as this 2024 race is a referendum on the United States, it is almost as much a referendum on Bach, and his ability to deliver on his vision. Make no mistake: that is why he made a trip last year to California, and in particular to Silicon Valley. He knows all too well that young people are immersed in their phones and screens and the IOC needs to figure out how to merge that world with sport to keep the Olympic Games relevant with the world’s teens and 20-somethings. This is why, right now, out of the 40 points in Agenda 2024, there’s one — one — that so far has proven meaningful, and that's the launch of the Olympic Channel. This is why there's urgency in linking the 2024 campaign to Agenda 2020. Back to Paris for the purpose of getting the sentiment out of the way, and quickly. Paris played host to the 1924 Games; 2024 would be 100 years later. The IOC, though, is not in the anniversary business. Ask Athens. It sought 1996 after 1896. Those Games went to Atlanta. The thing about Paris, and sentiment: I lived there for a summer and have been privileged since to visit several times. I have gone for early morning runs down the Champs-Élysées, looping across the Seine and around the Eiffel Tower. Memories. I get it. Totally. Typically, a major factor in these IOC bid campaigns is where the members’ spouses would like to be for 17 days. There’s a cogent argument to be made that, you know, you could find worse places to be for nearly three weeks than Paris. But maybe not when the entire nation of France has been under a “state of emergency” since 2015 and anxieties are high at even the most senior levels of government over the risk of another terror attack. Or when one of the attacks was directed at the national stadium in suburban Saint Denis that would be the emotional center of a 2024 Games. To be truthful, security matters, and it may matter a lot in deciding 2024, but the IOC must itself confront an issue more under its own control. Take a moment, please, to re-read those dollar figures: $51 billion for Sochi 2014, $40 billion for Beijing 2008, probably $20 million for Rio 2016, an advertised $7-plus billion for Tokyo 2020 already up to maybe $30 billion with the IOC insisting that $20 billion just won’t do. Take another look at all the cities that have dropped out for 2022 and 2024. This is why, all around the world, the IOC has a huge or, if you prefer, bigly credibility problem. Bids want to say, we can do the job for x. Seven years later, reality check: the cost is x-plus-plus-plus and in western democracies there’s taxpayer freak-out, and understandably and appropriately. LA 2024 is the turnkey solution to the IOC’s credibility problem. That LA24 is the turnkey answer is so obvious. That solution is rooted in both emotion and logic. Or, if you prefer, emotion and math. The LA24 budget calls for $5.3 billion of revenue and costs, with a $491.9 million contingency stash. With the exception of a slalom canoe venue (no big deal), everything is built. The bid gets the use of an about-to-be-built, privately funded $3-billion stadium for the NFL’s Rams and Chargers. Southern California is — Olympics or no — in the midst of a massive public transit upgrade, with $88 billion in ongoing public transit investment as well as a $14 billion modernization of LAX (thank the lord) in addition to $120 billion in funding that LA County voters (me among them) approved in November. Read that last bit again: $120 billion in transit funding that’s happening without reference to the Olympics. Indeed, as Table 22, “Venue Funding and Development,” in Part 2 of its Candidature File delivered last October to the IOC makes clear, the Paris 24 bid calls for just three new items to be built. A new athletes’ village. A new media village. And a new aquatics palace, for swimming, synchro and diving. With all due respect to friends at the international swim federation, which goes by the acronym FINA, a new structure for swim sports, even if not really a "palace," is gonna cost a ton of money and be about the most unsustainable venue you might ever want to build. There are two events in which you draw sustainable numbers of people (that is, say, 15,000 or more) to watch swimming: the U.S. Olympic Trials and the Games. OK, maybe three: perhaps the evening finals of the FINA world championships, and then if someone like Michael Phelps is on the blocks. Get back to me if the U.S. Trials are going to be in Paris in 2024. This elemental math is why USA Swimming has, for its last three Trials, plunked a temporary pool in an already-built basketball arena in Omaha, Nebraska. This is why FINA, at its last worlds, in 2015 in Kazan, Russia, plunked a temporary pool inside a soccer — er, football — stadium. This is why the LA24 plan is to plunk a temporary pool on a baseball field at the University of Southern California. This is why the LA24 bid abandoned its initial plan to build a new (would have cost $1-billion) athletes’ village in downtown LA in favor of (already there) dorms at UCLA. Our French friends might say, OK, but the government guarantees the costs, and we promise to keep them down. They say the Paris 2024 infrastructure budget would be 3 billion euros, about $3.2 billion USD at current exchange rates. Of that 3 billion euros, they say, the national government would pony up 1 billion; the city of Paris, 145 million; the Paris regional government another 145 million; the region of Seine-Saint Denis 135 million. That totals 1.425 billion euros. For purposes of discussion, let’s take our French friends at their word. 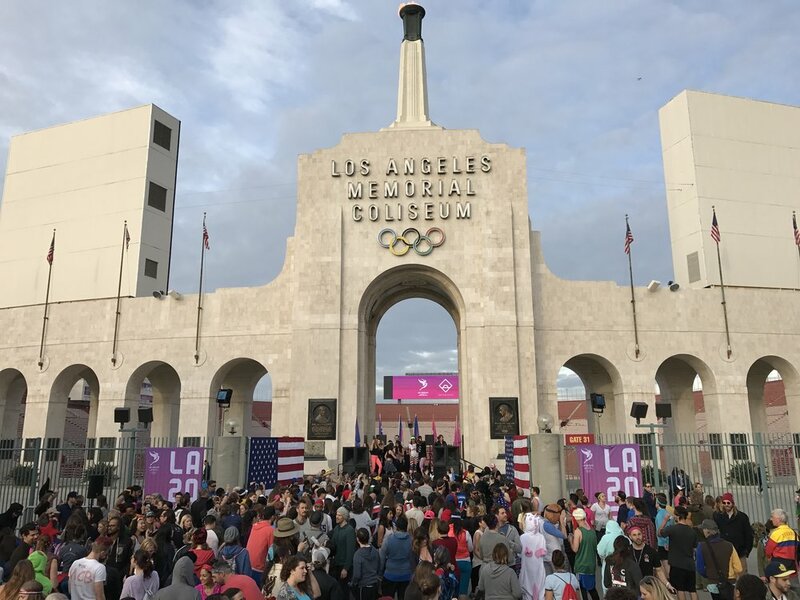 Here, though, is the lesson from prior Games that are not the model of Los Angeles 1984 — that is, that are not privately run and that depend in part or, more likely, in significant measure on government dollars, as a Paris 2024 Games would, and this is why the IOC needs Los Angeles now and not Paris. As London 2012 and Rio 2016 proved and Tokyo 2020 is proving again, if the government is a democracy and not a more authoritative if not autocratic institution — think China or Russia — commitments change. It may be worthy of an academic or journalistic panel in these early days of 2017 to have a discussion about what is a “fact” and what makes for the “truth,” but it is a damn fact and that is the straight-up truth: commitments change. That is what the past 20 years have proven, and unequivocally. The consequence of that fact and that truth is the follow-on taxpayer freak-out. That equation needs to be broken. That's what a private-sector bid like Los Angeles — in 2024 just as in 1984 — does. In LA, 2024, 1984, math is math. It means, simply, the math is certain. There is no other option because there is no government money. For taxpayers, that means there is no risk of having to siphon off monies that would otherwise be designated for, say, some social service. The LA24 plan says $5.3 billion. It will be $5.3 billion. Actually, costs probably won’t even reach $5.3 billion. They probably will total less. And the “fact” is, which the bid committee can’t say for political reasons but this space can because it’s patently obvious: the Summer Games haven’t been in the United States since 1996 in Atlanta, which means pent-up sponsor demand. That means all involved are virtually certain to make tons of money. IOC friends, to reiterate: all involved are likely to make money instead of reading bitter news reports about overruns and deficits. Again, even if you might be inclined not to like us Americans all that much, everyone can get behind certainty and surplus. Along with certainty and surplus, you also get everything that makes California, the world's sixth-largest economy, so relevant. The IOC’s No. 1 objective is to be relevant with young people. What, especially, do they like? Tech and media. That’s why the IOC launched the Channel. California means tech and media like nowhere else. Here, then, is the opportunity to combine tech and media with sport. So obvious. Hollywood. Facebook. Apple. Snapchat. Google. Twitter. These companies and industries, genuinely, want to get involved. Why? An Olympics in Los Angeles in 2024 would not only be prestigious, interesting and unusual. It’s a vehicle though which these companies could reach literally billions of people. In Olympic speak — they could grow not just the IOC brand but, as well, the individual sports themselves that make up the Olympic Games. Straight up: it's not just the companies and industries of California but the people of LA who would like to have you. Like nine of 10 say, yay for the Olympics! In a democracy, those numbers are all but unheard-of. More, and IOC friends: you really do want to be on Mr. Trump's good side. Because if you turn down Los Angeles after dinging Chicago for 2016 and New York — Mr. Trump’s kind of town — for 2012, it really might not go so well for you. This means you and the IOC itself. While you wonder why we like ice so much. We're different. Different doesn't need to be better or worse. Just different. By 2024, it will have been 28 years since Atlanta, 40 since the last time you were at the Coliseum like the daybreakers were at sunrise on Thursday. Straight up: it’s time to come to California. Dude, kind of a no-brainer, really.